What's black and grey and cute all over? 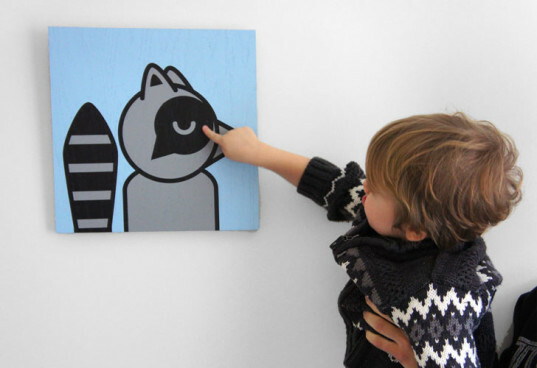 Why it's Rocky Raccoon - an adorable hand-painted critter painting from Modern Bird - makers of a charmingly cuddly yet decidedly modern collection of art for tots called ModTots. If you’re looking for some eye-catching art for your hipster baby's room, look no further than ModTots. This arty new family venture from Gregg and Megan Deal of Modern Bird was inspired when the couple was expecting their first child and couldn't find any art that they liked for their nursery that was both modern and kid-friendly. So Gregg started painting himself, and ModTots was born! Now, with an animal collection, robot collection, sweets collection and even a monster collection, ModTots is rapidly expanding the art options for cool kids and their design-loving parents. 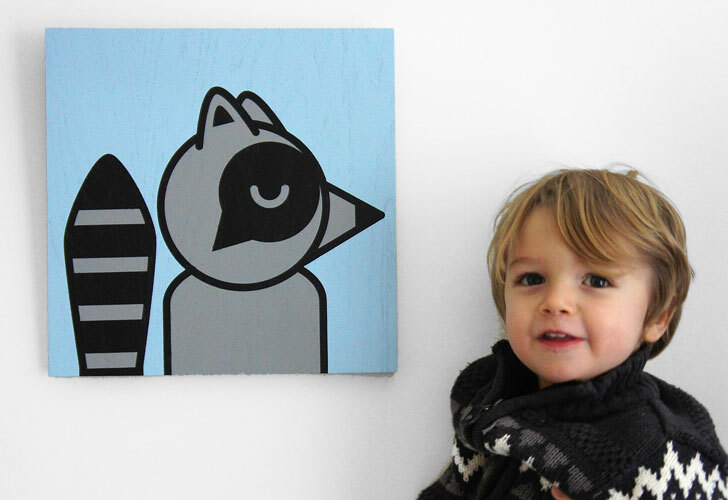 Using non-toxic paints, each graphic piece of ModTots art is custom painted to suit a buyer’s taste by Gregg. His critters all have great names and back-stories which you can read about on the company’s site. ModTots was kind enough to send me a sample Raccoon painting for my little dude Petey. Petey took an immediate liking to our new Raccoon friend and named him “Rocky.” I think it makes a great art piece for his room that isn’t cringe-worthy for adult visitors, and he likes to tell me stories about Rocky’s adventures. Kid tested – designer mother approved! The ice cream one is awesome. Adorable! I like the monsters! cute! i think this works will with any decor. it's a great way to add some whimsy to a space! Adorable! I love the food-themed images. 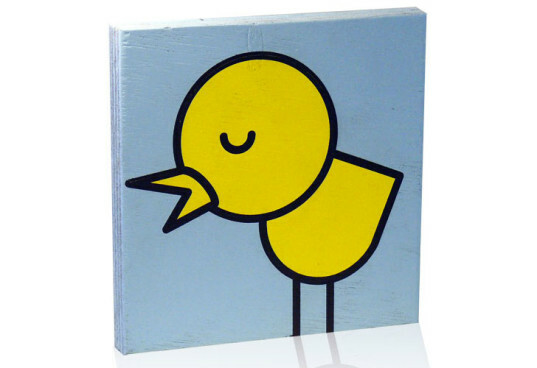 Using non-toxic paints, each graphic piece of ModTots art is custom painted to suit a buyer's taste by Gregg. His critters all have great names and back-stories which you can read about on the company's site. William the Messy Monster wants kids to clean up their messes. Teeth Monster wants kids to brush their teeth. Tantrum Monster wants kids to chill out and cooperate. Nap Monster wants kids to take their naps. We all scream for ice cream art! Love sweets? Hang these playful chocolate chip cookies on the wall. Part of the "Animal" collection of prints, this deer is available with a choice of 19 different background colors.